An airport can be a confusing place, especially if you're not flying every week. My team partners and I analysed the whole process from the beginning. Starting with how to book a flight, how to get to the airport, how to find free parking slots and the right terminal, as well as things like the current security and luggage regulations. 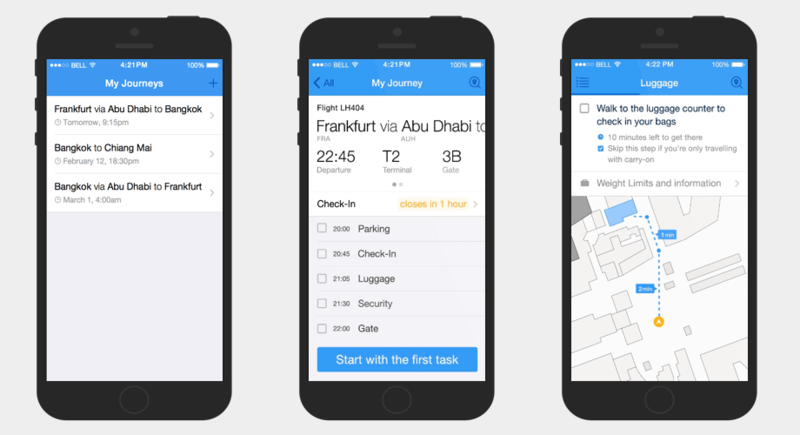 We came up with three key features: Managing your Flights, Airport Navigations and Airport Services. Out there are dozens of flight booking apps and websites. They may be far from perfect, but the booking process is basically a solved problem. We agreed to go another way. Airport syncs with your airline user accounts, so your flights are always in sync and you don't have to enter your personal info every time you want to check-in. You still can add a flight manually by adding the flight number. Airport lets you know if your flight is delayed, the gate has changed, or other unforeseeable events occur. Airport breaks down the process at the airport into smaller tasks such as Parking, Check-In, Baggage, Security and boarding. Just like with a car navigation system, you always keep track of your current position. During your stay at the airport, you can always take a look at information relevant to your current task, including luggage weight limits, security regulations and more.